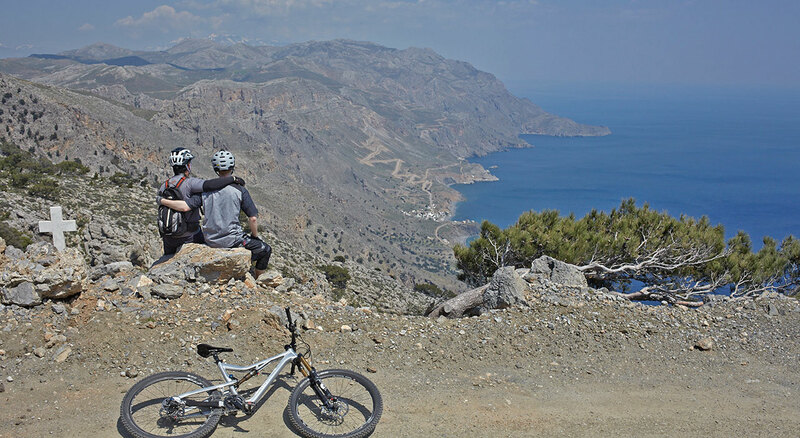 Echte Erlebnistouren im tiefen Hinterland von Kreta fährt man mit den Guides von Cretan Sports Cycling. Als Locals kennen sie die abgelegensten Touren und Trails die zu traumhaft schönen Küstenabschnitten und Hochtälern führen. Es geht von Etappenhotel zu Etappenhotel wobei Ihr selbst mit einem Tagesrucksack unterwegs seid und das restliche Gepäck geshuttlet wird. Der Pick Up ist geländegängig und dient gleichzeitig als back up für den Fall, dass schnell Hilfe benötigt wird. Die Charakteristik der Touren erinnert an einen Alpencross. Kontinuierliche Anstiege und dann entweder ins Tal hinunter, oder auf einer Hochebene mehr oder weniger wellig dahin. Durch die Shuttle Unterstützung habt Ihr am Nachmittag oft mehr Tiefen- als Höhenmeter auf dem GPS Gerät. 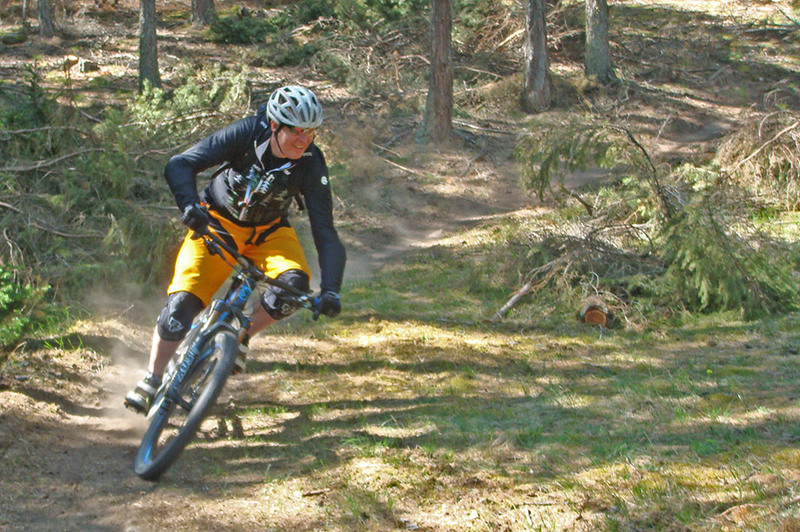 Auch hier wird wieder viel über Schotterwege bergauf gefahren, aber auch die ein oder andere Singletrail Passage ist dabei. Die Etappen selbst sind zwischen 25 und 70 km lang und sammeln 500 bis 2000 hm / Tag. Bei frühem Start hat man dann den Nachmittag um Land und Leute zu genießen und am Etappenhotel zu relaxen. Die Touren können auf zwei Arten gebucht werden. Entweder bucht Ihr Euch in einen der ausgeschriebenen Termine ein, oder ich bucht als geschlossene Gruppe (ab 4 Teilnehmern) eine individull gestaltete Tour die dann zu Eurem Wunschtermin stattfindet. Als Räder können das eigenen Bike mitgebracht werden oder auf einem unserer Stationsräder gefahren werden. Cretan Sports Cycling verleiht Haibike E-Bikes, FUJI Nevada 29" Harrtails oder Wielier 26 Zoll Hardtails mit einfacher Ausstattung (siehe Radstation Heraklion) alternativ können aber auch Räder aus den anderen Crete Cycling Stationen gemietet werden. hier wollen wir Euch den Ablauf einer Tour durch Zentralkreta skizzieren wie er stattfinden kann. Abweichungen können geplant werden, müssen manchmal wetterbedingt sogar vorgenommen werden. Wir starten an der Nordküste Kretas, nehmen den höchsten Berg Kretas, den Psiloritis in Angriff und erreichen nach halber Strecke die Südküste Kretas. Topografische und kulturelle Highlights werden Euch den Atem rauben, aber auch der ein oder andere Anstieg hat es in sich. Wie so oft im Leben lohnt der Einsatz und auf dem Rückweg warten wieder tolle Abfahrten und Gegenanstiege. Welcome to Heraklion Crete’s capital. Heraklion is a modern city with squares and secular streets, several shops, coffee shops, intense night life and with multicultural profile, the city combines archaeological treasures and the image of the city with the urban rhythms on the other side. The Old Town makes you trip to the past, surrounds you with Venetian walls. We welcome you from Heraklion airport and check in at Hotel. In the afternoon you will be able to walk and sightsee through the city. We have our meeting in the evening for dinner and get to know each other. We are starting with cars our tour from Heraklion early in the morning and heading to Strouboula plateau, and then we start our journey to Psiloreitis Mountain, a nice pathway that gives us the opportunity to see the geological diversity of this mountain with the rich alternation of landscapes. As we Continue our course, we pass the village Gonies , towards for village Anogia(altitude of 750m) which is a special place inhabited by hospitable people who remain faithful to the traditional way of life.Following an ascent pathway with lot of natural beauty we can see Mitata, low round houses made from stones. In location with altitude 1200m we can see a small stone church of Agios Yakinthos (St Hyacinths), protector of love through the years. We continue our sightseeing to the magnificent landscape of huge oaks, passing by the Zominthos archaeological place and of the meadow of Koursonas. Accommodation and dinner in a traditional guesthouse in the village. 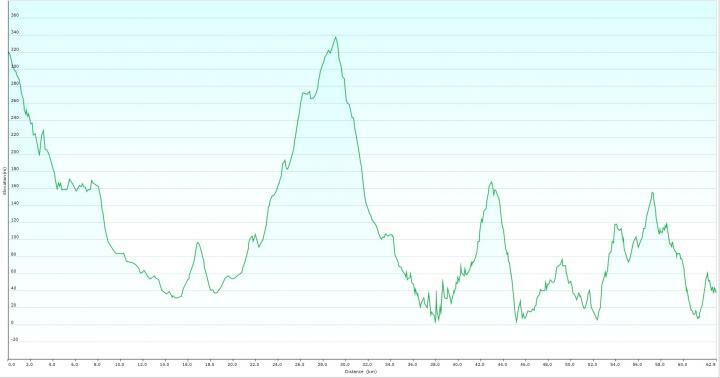 After breakfast we start a challenging route climbing from 1.032 m to 1.563 m to Skinakas. A route with magnificent view of the south side of Psiloritis mountain, where we can see the majestic forest of Rouvas. Then we follow a nice pathway through oaks, maples, pines and cypresses, on our way to Gergeri village.We Continue to the village Nivritos, Lake Votomos area with great view and shelter for many aquatic birds, and at last we finish our tour on Zaros a rich floral village. Accommodation in a guesthouse of the village. We are leaving Zaros village , following a beautiful road through the valley of Messara towards Phaistos, which in Minoan times was the center of southern central Crete. Towards to our journey, we see the Odigitria΄s monastery. We cross the natural beauty of Agiofarago, several meters away we can see beautiful beach with crystal clear water when we have the Opportunity to swim and some rest. Then, as we follow the pathway, we can see the Libyan sea, until we arrive at Lentas. The village has a special beach with pebbles and crystal clear waters, in addition of a majestic mountain scenery all around and we are sure it will win your attention. Accommodation in the village. We are starting a demanding, but a special pathway. We are heading to Trypiti beach. As we discover Asterousia Mountain. We continue with an excellent view on beautiful beaches, ravines, gorgeous and dangerous cliffs which leads to the sea, in Europe there is no place similar to this. We are finishing our tour on Kapetaniana traditional village (altitude 800 meters). The location of the village is unique as it combines the element of unique mountain views and the views of the Libyan Sea. In the afternoon, optionally we can climb to the top of Kofinas. Accommodation in a traditional guesthouse. We are going to cross a fantastic downhill route from Kapetaniana to the seaside village of Agios Ioannis (St. John. ) Then we will cross the beautiful pathway to the cave of St. Anthony, from now on and for a few places it might be needed to cross the pavement carrying our bikes because of the inaccessibility of the pavement. We are going to pass a small pine forest and oak trees until we reach the Koudoumas Monastery. The monastery was built on a secluded seaside location in a unique place. we arrive at Sopata (altitude 1023m) and continue with our bicycles our tour in the way to Paranumfoi village and Mournia and Ethia as well. We will combine a break in this pituresque village. Then there is a pathway on our way to Achendrias and we will descent to the Mesochorio village having the magical image of the plain of Messara. Finally we are transfered by our bus to Archanes village. Accommodation in a traditional guest house. Archanes village –Katalagari village – Peza village. Today we'll cycle through rural raods to the inland of Heraklion prefecture, and we 'll have the opportunity to visit areas with a rich variety of archeological , historical sites, monuments , and local villages boasting important examples of traditional architecture . Accomontation in Heraklion.